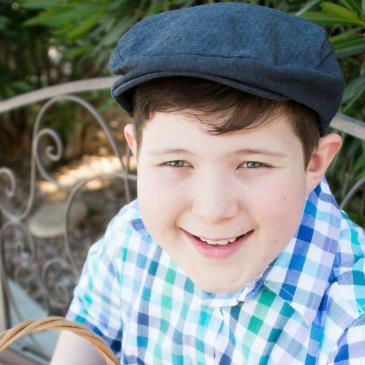 At 12-years old, Andrew is a friendly and sincere boy who likes Pokémon, video games, and spending time with his family. Even though he lives in the Arizona desert, Andrew absolutely loves surfing, after twice having the chance to take part in a surfing program for children with medical challenges. For Andrew to even be able to participate in such a program is something that is amazing in and of itself, due to him suffering a brain injury at birth. From that moment on, Andrew’s little body experienced one complication after another. The left side of Andrew’s body was tight and rigid. His head was always tilted to the left side, and his left arm was held very tight against his body and could not function like it should. Little Andrew’s gastrointestinal system was also functioning very poorly, resulting in numerous problems, including constant pain in his stomach. After many years and many unsuccessful attempts of diagnosing the root of these problems and more, Andrew’s parents finally found some answers through the help of a homeopathic medical doctor. Through their work with this doctor, Andrew was diagnosed with cerebral palsy. From this point on, Andrew and his family began a journey of discovery with new treatments and methods that have changed this young boy’s life. Andrew has had adult stem cell treatments a total of six times (stem cells are from healthy, full-term babies, and from his own hip). These treatments have been coupled with hyperbaric oxygen treatments, which have done wonders for Andrew’s healing. Unfortunately, these effective treatments are deemed “alternative,” and therefore are not covered by insurance. Andrew will be adopted as a Sparrow to Bogle Junior High, in Chandler, AZ. Thanks to the support of Black Rock Coffee Bar, students at Bogle will have the opportunity to work hard to raise money for Andrew’s ongoing treatment, through sponsored community service and fundraising projects.